When Disney set out to create an animated version of Treasure Island, some fifty years after its live-action version, it needed a twist. It settled on: outer space. If there is one thing we can all dream about, it’s finding buried treasure. We could all use the money, of course, and this way it comes with mystery and romance and adventure. What more could we ask for? Pirates. That would add danger, ratchet the adventure up to a new level, and give us desert islands and the high seas. It would also add a touch of nobility, exalt us beyond mere fortune-seekers to the brave fighters of vicious cutthroats. We are the heroes of our story. This is the enduring charm of Treasure Island. We all want to have the treasure, and the adventure, and come triumphantly home at the end. Treasure Island has been remembered and retold, made and remade in film after film. When Disney set out to create an animated version of Treasure Island, some fifty years after its live-action version, it needed a twist. It settled on: outer space. And so Disney gave the world Treasure Planet. The movie may be labeled science fiction, but it can even more accurately be labeled science fantasy. The creators merge Stevenson’s nineteenth-century milieu with sci-fi, and this is most clearly seen in the ship that carries our heroes to the treasure planet. Although it is, in a highly technical sense, a spaceship, it looks like a wooden sailing ship from the nineteenth-century. It even flies like the old ships sailed, to some degree: Its sails are not decorative but entirely functional. A curiosity about this movie: In outer space, there is no gravity but there is, apparently, atmosphere. After watching the movie, I read a bit about it online, and evidently the characters’ ability to breathe in space is explained by “etherium.” I believe etherium was mentioned in the film, but I did not know what it meant. The sort of viewers who must have breathable outer space justified to them may find this film jarring or inconsistent in its science-fantasy elements. But if you’re game for the ride, it will go smoothly enough. The makers don’t merely choose a sci-fi setting; they go for broke. Jim Hawkins and his parents are the only humans in the film. In this telling of Treasure Island, Long John Silver is a cyborg – a natural enough leap from the one-legged man. The aliens that fill the background, and sometimes stand prominently in the foreground, are inventive but, with scant exceptions, unattractive. Disney transposes its mandatory Animal Sidekick to sci-fi with tremendous success: Long John’s parrot is, in this version, Morph – a small, playful glob of a pet whose shapeshifting and good -hearted mischief make it second only to Tangled‘s Maximus in Disney’s pantheon of sidekicks. Treasure Planet tinkers with the original novel to produce a solid, workmanlike plot. The movie shines far more in characterization. Jim begins the movie as what they call a troubled (read: delinquent) youth. This is not, of course, original, but what matters is that it is convincingly played and gradually becomes important to the story and, finally, meaningful. For this is the heart of his relationship with Long John Silver. Jim began that relationship distrustful, and Silver began it, at best, utilitarian; how quietly it became real, and how much it came to affect them, is a lasting credit to the film. Despite all his original intentions, Long John Silver becomes the father-figure Jim needs, giving him both discipline and encouragement. This is, of course, the most important relationship in the film. Jim’s other important relationships are with his mother and the doctor (here Dr. Doppler because, you know, sci-fi). All three are either parental or quasi-parental, and Jim doesn’t get a girl to so much as look at. To take a young protagonist and completely sideline romance in favor of such relationships is quietly subversive in a Disney film, and possibly in all films. Treasure Planet doesn’t quite ignite the magic of Disney’s best; possibly, with its visions of robots and outer space and bizarre aliens, it never really tried. Disney is the undisputed king of pop fairy tales and this film is an outlier. It never broke through to audiences in a way that could inspire successors of any kind. Still, the care and skill of the creators can’t be doubted. 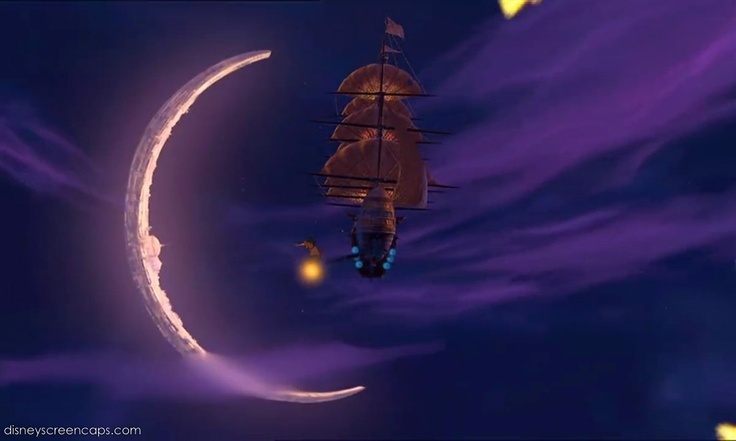 Treasure Planet is a creative sci-fi romp, with heart and with humor, and some lovely animation. Recommended. I’ll second the recommendation. I can’t really put my finger on specifically why, but I always thought this was one of the more underrated Disney animation flicks; it’s been a delight each time I watch it, for story (a weakness for nautical adventure stories helps) as well as some of stunning artwork. What may intrigue me the most is that the ‘gimmick’ is made to work so well, bringing a modern sensibility of imagination into the classic story, without losing the heart of it. So often modern ‘retellings’ of classic tales end up mashing and mutating into self-parody or dissolving into mawkish sentimentality (or both); Treasure Planet manages to avoid those traps. Very good point about how they added a “modern sensibility of imagination” and kept the heart! The movie has a classic sci-fi feel, with elements such as the moon port-city (which is gorgeous) and the aliens (which aren’t, but are still creative). Maybe the spirit of Treasure Island fits in with the spirit of classic, or even pulp, sci-fi? It’s been forever since I read the book, but I wonder.